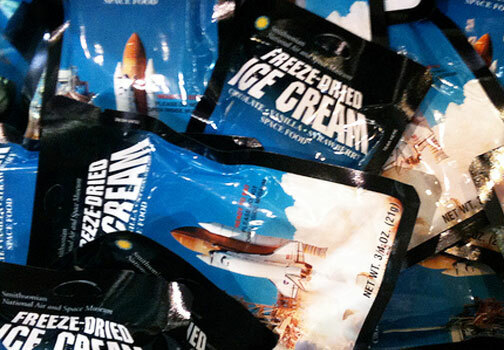 Astronaut ice cream definitely isn’t the stuff sitting in your freezer at home. Though compelling, its name doesn’t quite capture the oddity of unwrapping its small foil packet to reveal a Styrofoam-like substance. For those of us who grew up loving everything about space exploration or perhaps were simply bribed with the staple gift shop snack after a long afternoon at the museum, we know the concept of astronaut ice cream is by far more intriguing than its actual flavor. Perhaps that explains why this astronaut ice cream never made it to space again after the 1968 Apollo mission. So if astronauts don’t eat astronaut ice cream, what do astronauts eat? These days, the answer to even a seemingly simple question like “what do astronauts eat,” is almost as complicated as an international menu. Most of the food available to astronauts while they are in space is either packaged in retort pouches or has been freeze-dried. When you think of a retort pouch, think of a Capri Sun juice pack. The sterile plastic and metal foil laminate pouches keep food fresh, avoiding spoilage. The freeze-drying process, on the other hand, essentially removes the water from the perishable food stuff creating a lighter, dry packaged product with a much longer shelf life. All of this less than appetizing food is either considered ready-to-eat or is prepared simply by adding water or reheating. Space is no place for your Mario Batali moves. But designing food for consumption in space isn’t as simple as repackaging your mom’s spaghetti dinner leftovers. Before a food item can make it onto the astronaut menu, it must meet several strict criteria. First and foremost, the food must be appropriately engineered for consumption in space, where the micro-gravity environment poses some pretty fascinating eating complications. Food must be light, as storage space on an aircraft is generally limited and weight capacities are taken seriously. In addition to good packaging, the food must also be easy to serve and especially easy to clean up. A few crumbs are an annoyance on Earth, but in space those floating bits of bread can become lodged in shuttle vents or even inhaled by the unsuspecting astronaut. Lastly, the food going into space must be approved, and, no, not necessarily by taste-test (though the process is getting better). Approved foods and meals must be considered “physiologically appropriate,” meaning that they have to be nutritious and easily digestible. Food items also go through a strict approval process by NASA nutritionists, who work within the Recommended Dietary Allowances (RDAs) of necessary vitamins and minerals for a person’s proper performance in space. Caloric requirements are also considered using a fancy formula using an astronaut’s gender, height, weight, and age. For instance, astronauts in space require higher daily values of calcium, but much less of iron. This is not your regular Weight Watchers program. What astronauts eat in space has changed dramatically since the first steps on the moon. The astronauts of Project Mercury (1959-1963) were the unfortunate guinea pigs of space travel in more than the obvious arenas. In addition to being some of the first men to orbit Earth in spaceflight, they were also the first to ingest what NASA called food. These pioneering astronauts endured bite-size food cubes, freeze-dried powders, and liquid-like substances in aluminum tubes. Imagine sucking dehydrated pastes out of tubes and calling it dinner. The food got better with practice, as better packaging technologies led to better food choices and quality. Those bite-sized cubes eventually were covered with gelatin to prevent crumbling (remember: a clean spacecraft is a healthy spacecraft) and those freeze-dried foods were packaged in specialized containers that allowed for better and easier reconstitution. But it wasn’t until the Apollo Program (1968-1975) that astronauts finally had access to hot water. Wouldn’t you prefer your freeze-dried porridge warm and without clumps? It was perhaps after hearing about their predecessors’ culinary experiences, that the astronaut crew of Gemini III (Project Gemini, 1965-1966) decided to smuggle some contraband in the form of a corned beef sandwich. Supposedly it was the floating breadcrumbs that posed the issue, but more then likely it was the breach of strict NASA rules that caused the tizzy. After Mission Commander Gus Grissom enjoyed a few bites of his sandwich, NASA mildly admonished the crew and Congress held a hearing to force NASA’s deputy administrator to promise that it would never happen again. Since then, NASA has taken special precautions to monitor what astronauts carry with them on board. Even with better technology, a corned beef sandwich has not make it on a spaceflight since the “sandwich incident” of Gemini III. But things have gotten a heck of a lot better. By the time of Project Gemini, the astronaut menu expanded to include such delicacies as space-approved butterscotch pudding and shrimp cocktail. We’re not convinced that it was as good as the real thing, but it sure beats pureed meat in a tube. Astronauts can even have a hand in picking out their own menu, with approval from their nutritionists of course. And these days, astronauts also have access to condiments, but it’s not as simple as asking to pass the salt and pepper shakers. As the granules pose a floating threat, salt makes it on board as a salty liquid solution and pepper comes suspended in an oily paste. They also have space versions of good old mustard, ketchup, and mayonnaise. These days, astronauts even have limited access too fresh foods (known as FF). The more roomy conditions on the Skylab space station allowed for an on-board refrigerator and freezer. Those FF like fruit, vegetables, and tortillas only make it through their first two days on board after a resupply mission before spoiling, but they are appreciated by the culinarily-deprived astronauts and are considered a form of psychological support by NASA. A little bit of familiar food to ward away home sickness and the unfamiliarity of space travel. The way astronauts eat has also changed drastically with developments in space travel. In space travel’s early years, experts were worried that the micro-gravity environment of space would impair an astronaut’s ability to swallow. After it was determined that swallowing was not one of the issues posed by near weightlessness, things began to improve. We know now that thankfully even without gravity astronauts are able to swallow, but they generally have a hard time smelling. In micro-gravity, food aromas waft away before reaching the nose and astronauts live in a constant state of stuffiness as their bodily fluids tend to rise to the top of their bodies. With stuffy noses, their sense of taste is a bit off. These days, astronauts are able to simulate as much as possible the feeling of sitting down to a family dinner. Their food trays, which act as plates, have straps on the bottom that allow them to be fastened to their legs as they sit (or even to an anchor point on the wall or table) as well as straps and magnets on their surface to fasten food pouches and utensils. The Skylab space station even had a dinning table with footholds that allow them to “sit” a the table rather than float. While there will always be difficulties to life in space, the quality of life in terms of regular meals and food has only gotten better over time. It is expected that in order to make much longer manned space trips, astronauts will have to begin cultivating some of their own sustainable fresh foods. There just isn’t enough room to pack all that freeze-dried pudding. Today, the International Space Station provides a new venue in which international astronaut lunch box trades only make lunchtime more exciting. I’ll trade you an American peanut butter and honey sandwich for some of that tubed Russian borscht. Want to learn more about eating in space? Dr. Richard Barrans Jr. steps us through the problems with traditional foods in micro-gravity here. What do you get when you mix Mythbusters team Jamie and Adam, Momofuku chef David Chang, and astronaut Chris Hadfield? A really interesting culinary experience in space! Check out this video.